Despite indescribable agony, despite the horrors they saw all around them, many Jews retained their faith during the Holocaust. They did their best to observe Shabbat, celebrate the festivals, and remain on a high moral and ethical plane even while the Nazis did all they could to dehumanize them. 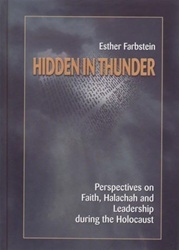 This book covers a broad spectrum of topics: individual and communal prayer, the role of rabbis in the lives of individuals and communities, and halachic and moral issues, including dilemmas concerning rescuing people or handing them over to be killed, hidden children, marriage, and agunot. Special attention is given to the survivors' lives after liberation and the material, emotional, and spiritual problems that they faced. The author's historical approach is enhanced by her solid Jewish knowledge, including familiarity with the Jewish values that influenced the Jews' responses during those dark days. The historical documentation, some of it presented here for the first time, reveals a rich pattern of life that coexisted with - but was diametrically opposed to - the pattern imposed by the Nazis. 2 volumes.